The month of March brought new concerns about the safety of students, employees, and visitors on the UNC-Chapel Hill campus. Vandals desecrated the Unsung Founders Memorial, and a group of white supremacists brought weapons, including firearms, onto the campus in violation of state law. On Tuesday, April 9, I introduced a resolution to the Board of Aldermen urging the university to take bolder action in responding to and preventing these kinds of incidents. I’m proud that my colleagues on the board unanimously passed this resolution. 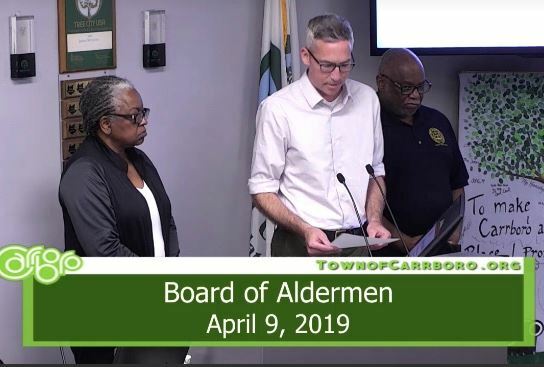 Alderman Damon Seils made a motion, seconded by Alderman Jacquelyn Gist, that the following resolution be approved. The motion passed unanimously. NOW, THEREFORE, BE IT RESOLVED by the Board of Aldermen that the Town of Carrboro, NC, urges its neighbor and partner UNC-Chapel Hill to rescind trespass warnings against student antiracist activists; to press charges and issue trespass warnings against persons who on March 16 carried firearms onto the campus; to clarify when the community may expect the presence of an armed person on or near the campus to trigger an Alert Carolina emergency notification; and to invite community members not necessarily affiliated with the University to participate in the campus safety commission being convened by the interim chancellor. BE IT FURTHER RESOLVED that the Town wishes to partner with UNC-Chapel Hill in a shared commitment to helping students feel safe in Carrboro through better communications, education about the Carrboro Police Department, opportunities to participate in Town programming and advisory committees, continued participation in the Good Neighbor Initiative, and other efforts. BE IT FURTHER RESOLVED that the Board asks the clerk to share this resolution with the interim chancellor of UNC-Chapel Hill and the members of the Chapel Hill Town Council, the Hillsborough Board of Commissioners, and the Orange County Board of Commissioners. This entry was posted in news on April 10, 2019 by Damon.